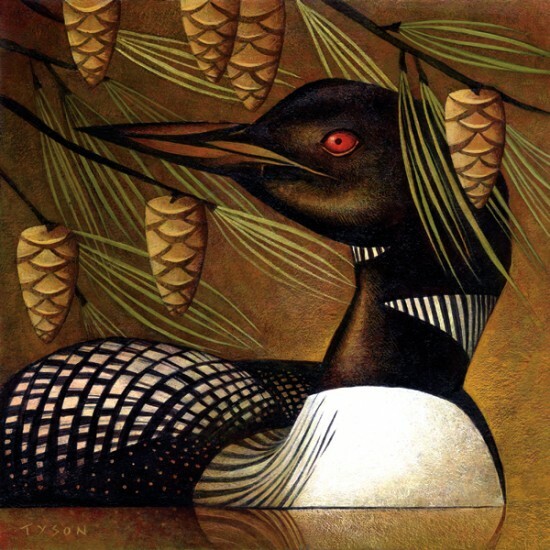 Sara Tyson began her career as an illustrator 30 years ago. After completing her studies at the Ontario College of Art in Toronto, she worked for many years as both illustrator and graphic designer in national magazines. This dual role as a professional increased her understanding of the function of illustration in communication arts and also made her a thoughtful problem solver. Her figures occupy a highly organized space, with shape, texture, contrast and colour all playing important parts in her concepts. Sara is inspired by early Christian and Byzantine art. The figures possess very rigid facial expressions, which evoke a sense of tension. There is great power and immediacy. Every gesture speaks loudly. Compositions are flat and hierarchical with no systematic use of perspective, which creates odd scales and frames of reference. Sara finds that this environment lends itself well to story telling. Favourite artists of the 20th century include Pablo Picasso, Lyonel Feninger, Henry Moore, Diego Rivera, Ben Shahn, Georgia O’Keefe and Francis Bacon… just to name a few. © 2019 Sara Tyson. All rights reserved.